THE PENDANT AND CHAIN ARE MARKED 925. Ending 29 Apr at 5:01PM BST6d 1hCollection station availableMetal: Sterling SilverStyle: ChainLength: 20 - 21.99"
Size 5.7cms x 4cms. weighs 6.6gms. Hallmarked for London (cat) and an itallic 'h' which the closest I could find was 1963, and BJ LD but I have not established who this is yet. 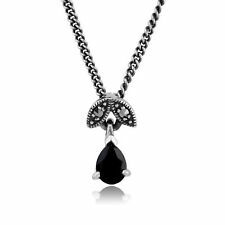 It has all its stones and it is on a fine 16" chain and the clasp functions well. On a 20" Silver Belcher Chain. In good Condition. The pendant is held on a linked sterling silver chain fastened with a spring ring. Length of Necklace: 23cm. Chain: 16" or 18". CROSS IS ET WITH A PALE BLUE STONE. IN ORIGINAL PRESENTATION BOX. Stunning Peardrop Necklace. - Also available in blue Gilson Opal & in a smaller design. "Natasha Rose Jewellery". Quality Genuine Sterling Silver products. in Fine Sterling Silver & Semi-Precious Gemstones. 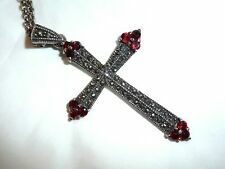 To all intents & purposes this looks like a Victorian Ruby & Diamond Necklace. Superb Fretwork on the pendant, even on the reverse which has been left Silver. I have never worn it as I really prefer gold. 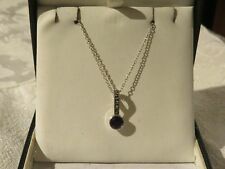 GORGEOUS STERLING SILVER PENDANT / BROOCH ON FINE 17" LONG CHAIN. THE PENDANT CAN BE WORN AS A BROOCH AND ATTACHES WITH A VERY SECURE PIN AND ROLLOVER CLASP. THE PENDANT IS FULLY HALLMARKED/STAMPED FOR STERLING SILVER. Collection station availableMetal: Sterling SilverStyle: ChainLength: 16 - 17.99"
Sterling Silver 925. Manual, Working Order, Wind Up Watch. Size Of Watch Face. Width Including Winder. Length Of Watch Face. Depth 3.4mms. Whole Length Of Safety Chain. Will Fit A Wrist Of 180cms. 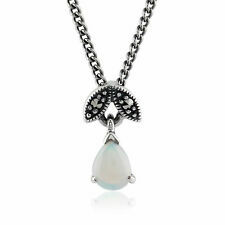 The pendant is flower-shaped and the topaz is faceted. It hangs on a linked sterling silver chain which fastens with a springring. Chain: 16". 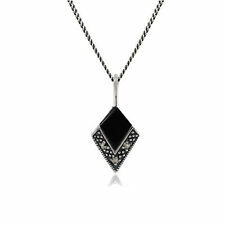 The pendant hangs from a linked sterling silver chain which is fastened with a springring. Lovely Fretwork on the pendant, even on the reverse which has been left Silver. I fell in love with it and bought it but have only worn once. It deserves to be worn. THE NECKLACE IS QUITE HEAVY AND SOLID, NOT FLIMSY. Superb Fretwork on the pendant, even on the reverse which has been left Silver. IT IS GENERALLY IN EXCELLENT CONDITION, IT JUST REQUIRES A POLISH AND THERE IS ONE STONE MISSING, AS CAN BE SEEN IN THE PHOTOS. SOLID SILVER. THIS IS A QUALITY CLASSY RING. SO BEAUTIFUL. THIS NECKLACE IS VERY DIFFERENT. THIS IS AT LEAST 20 YEARS OLD. not the ones shown in any pictures. I DO WAFFLE ON BUT IM VERY HONEST. COST A LOT WHEN WAS NEW. Onyx Information Mother of Pearl Information Stone Cut: Cabochon. Birthstone: May | Zodiac: Cancer | Wedding Anniversaries: 20th. Carat Weight: 0.27ct. Stone Size: 5x4mm. Black Onyx Information Carat Weight: 0.50ct. Stone Shape/Cut: Diamond, Cabochon. Beautifully made with the finest quality of silver and to a very high standard. Weight 40 grams. Dyed Cornelian Information Carat Weight: 0.231ct. Carat Weight: 0.152ct. Stone Size: 4x3mm. Garnet Information Birthstone: January | Zodiac: Aquarius | Wedding Anniversaries: 2nd. Carat Weight: 0.34ct. Stone Size: 5x4mm. Birthstone: February | Zodiac: Pisces | Wedding Anniversaries: 6th & 17th. Carat Weight: 0.384ct. Opal Information Item SKU: 214N488908925. Country of Origin: Australia. Natural/Created: Natural Mined Stone. Chinese Fresh Water Pearl Information Stone Shape: Drop. Stone Size: 6x4mm. Sapphire Information Birthstone: September | Zodiac: Taurus | Wedding Anniversaries: 5th, 45th & 70th. Carat Weight: 0.33ct. Stone Size: 5x4mm. Ruby Information Birthstone: July | Zodiac: Capricorn | Wedding Anniversaries: 15th & 40th. Carat Weight: 0.34ct. Stone Size: 5x4mm. Birthstone: February | Zodiac: Pisces | Wedding Anniversaries: 6th & 17th. Carat Weight: 0.24ct. Stone Size: 5x4mm. Peridot Information Birthstone: August | Zodiac: Virgo | Wedding Anniversaries: 16th. Carat Weight: 0.30ct. Stone Size: 5x4mm. Chain Type Main Stone Turquoise. Necklace Style Chain. Color: blue. You must complete your order using the CheckOut process. If the item you receive is not as described you get your money back. Height: 27 MM. Pendant Style Solitaire. You must complete your order using the CheckOut process. ChainType rolo. Stone Weight Style Chain. If the item you receive is not as described you get your money back. Height: 29.45 MM. Length: 18 IN. 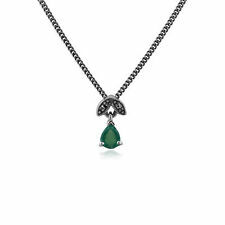 Pendant Style Solitaire. Chain Length 18. Length 18 IN. You must complete your order using the CheckOut process. Style Chain. If the item you receive is not as described you get your money back. SO MODERN SO BEAUTIFUL! We are fine jewelers and build our reputation on quality. Stone: Heart Turquoise (1) Polished Stone finish. Main Stone Color Turquoise. Main Stone Creation Treated. Chain: Box chain.